Video is playing now: There it is! The new phone. Curved edges, much bigger screen. There are two of them! One big one small. They're called the iPhone 6 and the iPhone 6 Plus. And, having said that he won't be bothering with a bunch of impressive statistics, Tim Cook is now going over some impressive statistics. Schiller: The iPhone glass wraps around the phone. The display is Retina HD - new in every way. Schiller: The colors are bright, stunning, and accurate. "Ion-strengthened glass." 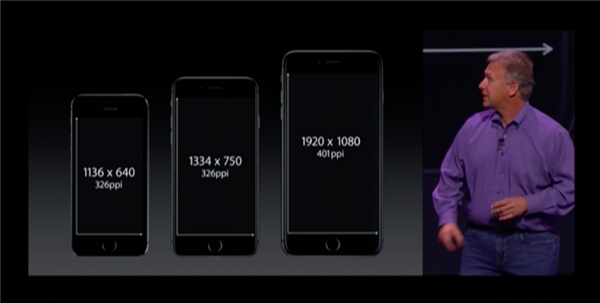 Schiller: New "dual domain pixels," allow wider viewing angle with accurate colors. 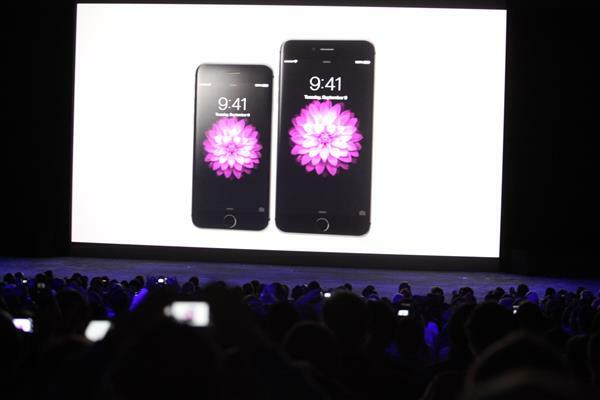 Schiller: Yes, the new phones are a lot bigger. 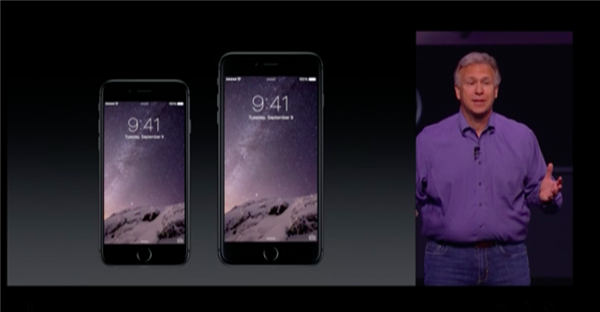 iPhone 6: 4.7" 6 Plus: 5.5 inches. the iPhone 6, and the iPhone 6 Plus. He's describing the new screen, which apparently can stop bullets. "And if you don't know, here are their sizes." Yes, even Apple has read the rumor leaks! Good god. The new iPhone 6 Plus has over 2 million pixels--and yet it's thinner than any previous iPhone. Those pixels must be squashed super flat. Schiller: "And here's the real magic: It's done in phones thinner than anything we've ever made." 6.9 and 7.1mm respectively. Schiller: "The text is incredible too, even sharper and more of it." Schiller: The phones are easier to use one-handed. "For example, you can move back in forwards in Safari by swiping back and forth. This works in Mail, Messages, and more." Schiller: Reachability: double-touch the home button and the screen slides down so you can reach everything one-handed. And the sleep/wake button is moved to the side. Schiller now moving onto App Store discussion. 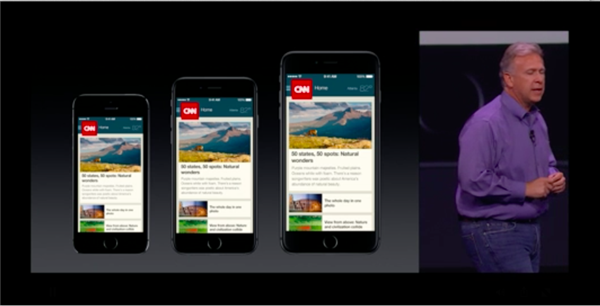 Now Schiller is discussing the developer side of this, adjusting current apps to the new display size. Apps can take advantage of the new horizontal display. To take advantage of the bigger screens, programmers have to rewrite their apps. Get ready for about a zillion new updates for your apps! The new phone is up to 50% faster than original iPhone at CPU, 84% faster graphics. And 50% more efficient than A7 chip. 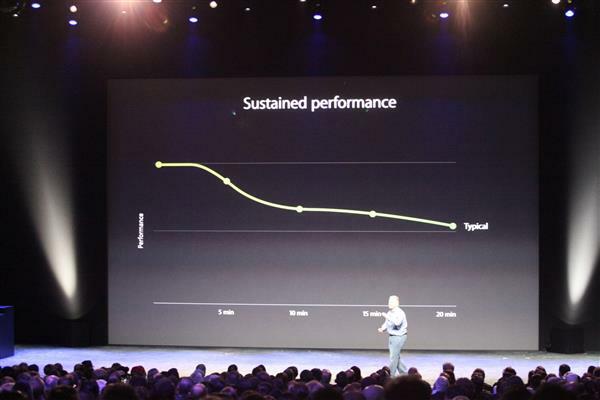 Gotta love these Apple Event graphs. It's always a line going up. Shares of GT Advanced Technology plunging, down 6%, after Apple doesn't use their sapphire screen technology in either new iPhone. The shutter-clicking sounds in this theater are deafening. I mean, the Eiffel Tower isn't photographed this much! Now they're going into major developer details. My eyes are glazing over. Schiller: With new games, like Metal, you can get maximum performance. 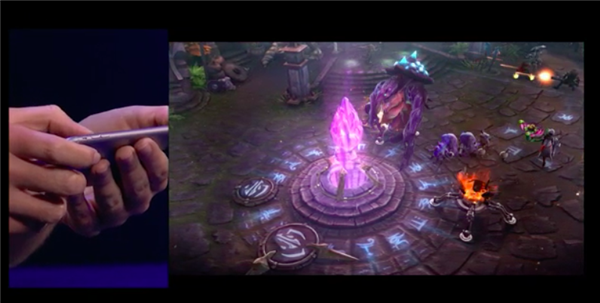 Showing a slide of about 25 games developers using the new chip. Now coming on to stage, Stephan Sherman, of games dev "Super Evil Megacorp." Schiller: Other phones need to throttle down performance so they don't overheat. Not the iPhones, he says. 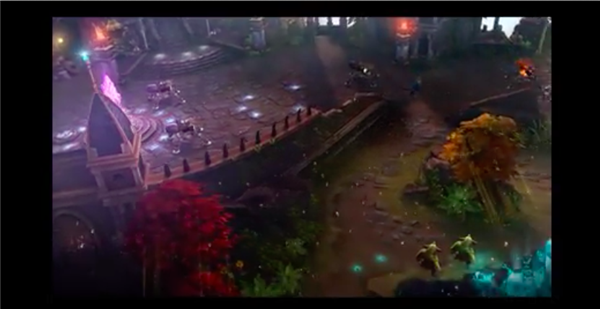 We're watching a video of a new iPhone game. It looks very cool. Then again, just about ANYTHING projected onto a 100-foot screen looks very cool. Wow. There are now 100,000 of you turned into this liveblog. We'll try to avoid typos. , the camera-clicking sounds are dying away. Sherman: You want to capture the Kraken and have him fight for you. He looks like Godzilla with a big glowing crystal wart on his back. The new iPhones, despite bigger screens, have battery life about the same (or, in the case of the iPhone 6 Plus), better battery life than the old iPhones. 80 hours of music listening... that's enough to play the "Lord of the Rings" soundtrack twice in a row.